Africa’s political landscape is mostly unstable with election rigging claims being a primary concern. In The Gambia, voting is still conducted via an old-fashioned, but effective, manual system using marbles. But for Senegal, Ghana and Kenya, the use of electronic methods to register and identify voters, and relay results has proved a turning point. Even so, none of the African nations, apart from Namibia, have played with the idea of full electronic voting. And although it is not a straightforward process, it still does hold promise as a fast and credible way to elect leaders. JustElect, a startup in Ghana, is now looking into introducing electronic voting in many institutions across the country with potential for further growth. The startup, led by Wendel Laryea and Rasheeda Yehuza, launched after testing a successful electronic voting prototype at the Kwame Nkrumah University of Science and Technology in Ghana, in 2013. After two years of research and development, it started building a commercial service and launched in beta in November 2016. IDG Connect got in touch with Rasheeda Yehuza to discover more. A lightly edited Q&A can be found below. JustElect is a secure cloud based elections platform that [facilitates] casting votes from anywhere on any device. Through long study and analysis of various voting processes, our team developed a cutting-edge solution that computerises the manual voting processes. How many people have used the platform so far? We are currently piloting the system in specific organisations, however, prior to this, we ran elections for over 1000 students at the KNUST Business School and over 2500 students at Kumasi Polytechnic in Ghana. What are some of the features of your platform? Our system provides a quick and easy way to create simple or advanced elections. Election results are automatically calculated and presented with beautiful charts. Transparency and reliability is a major key. JustElect enables organisations to share results in real time with voters and real time results notifications via email or SMS. The platform enables easy voting by allowing organisations to specify an URL slug for voters to quickly find elections. Elections are also optimised for desktop and mobile devices. 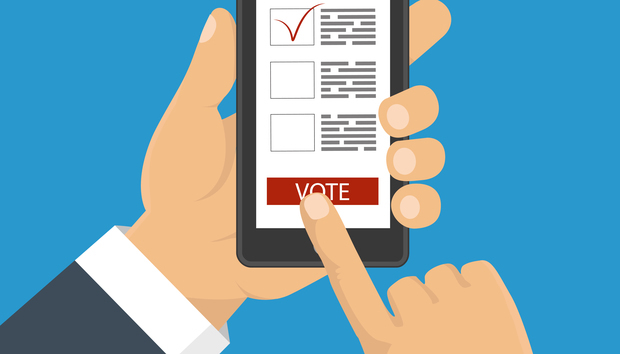 Voters can vote from a web browser via their mobile devices. How does the platform contain fraud in elections? Security is one of our top priorities and the system has been designed from the ground up to provide high security during and after elections, such as preventing multiple votes and unauthorised access. The platform offers both one and two way authentication for voters. This is determined by the organisation or community. This feature enables voters to use a voting code (private key) or a specific identification (public key) signed with the generated voting code. All data coming in and leaving the system is securely encrypted with AES 256-Bit Encryption. JustElect makes it easy to generate secured codes and deliver them to voters. Voting codes, keys and voting URLs can be securely sent to voters via email and SMS. This feature is ideal for voters who cast their votes remotely. Technology can play a role in bringing fairness in elections, how involved are the people handling the elections? With JustElect, the people on the ground only setup the elections and do not have access to information once the election is active. Results are automatically collated and sensitive information is encrypted. Election handlers only view election results after the elections, the same as voters. This makes it fair as the manipulation of election results is impossible. In your view which model for e-voting would work in Africa? Having booths with digital voting machines, in my opinion works best. This type of technology can be coupled with unsupervised biometric verification, which enables voters feel a sense of privacy and transparency. JustElect is currently used in this way and for the elections we have organised, there has been a tremendous turnout with voters excited about using electronic voting for the first time and viewing results in real time (if enabled by the organisation). Can e-voting lower election costs even with the technology needed? E-voting is much cheaper than manual voting. With manual voting, the budget covers several materials including, the printing of ballot boxes, printing ballot papers, hiring election officials, indelible ink, foolscap paper, pins and blotting paper, among others. These add up to huge sums of money. However, with an e-voting platform all you need is to electronically set up the entire election and election booths for voters. We anticipate cutting down election budget by over 60 percent based on the elections we have conducted. How much do you charge for elections on the platform? Our platform is free for small elections and cost less than 10 USD to upgrade to a medium sized election. Most elections in Ghanaian universities conducted by the Student Representative Council, departments, faculties, associations and societies cost at a minimum of 10,000 USD per year. For that same election using our platform, will cost less than 2,000 USD, cutting the cost by 80 percent. With technological advancement in Africa how easy or hard is it to have e-voting? E-voting is the future of elections in educational institutions and public organisations where people demand transparency and fairness. There have been recent calls to implement such a system in high schools in Ghana. The JustElect technology in itself is very intuitive and solves many problems associated with manual elections such as cost, human error, and forgery and promotes eco-friendly elections.